Photo credit: Jerry Lara, Staff, San Antonio Express-News. 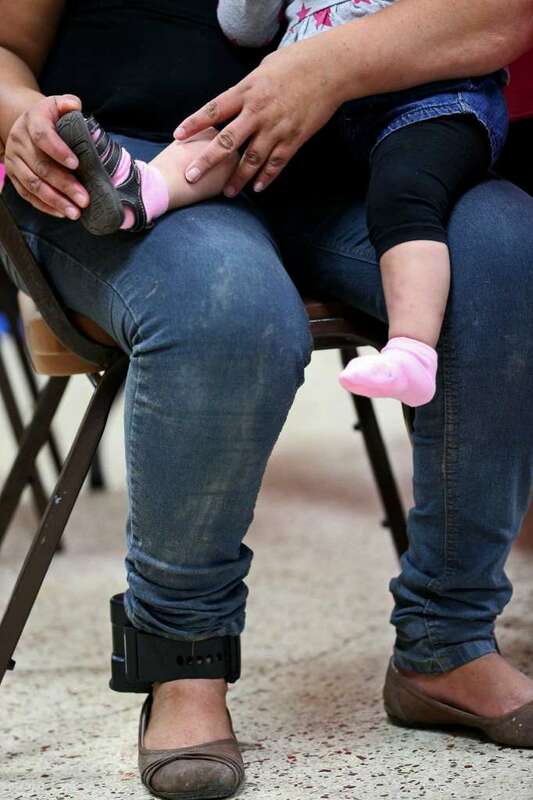 As the number of individuals detained not subject to mandatory detention—particularly mothers and children—has exponentially grown, DHS’ use of ankle monitors in setting release conditions has become the norm. [ix] Ankle monitors, in particular, are highly restrictive: they restrict an individual’s freedom of movement and require confinement in a specific space such as a private dwelling for approximately twelve hours per day. The BIA has not provided a satisfactory explanation as to why the definition of “custody” in the INA context cannot be afforded the broad interpretation employed in the habeas corpus jurisprudence—a definition of custody that would encompass restrictive release conditions that are not shared by the public at large. [i] See INA § 236(c); Philip L. Torrey, Rethinking Immigration’s Mandatory Detention Regime: Politics, Profit, and the Meaning of “Custody,” 48 U. Michigan Journal of Law Reform. Page, Issue 4 (2015). [ii] Jones v. Cunningham, 371 U.S. 236, 243 (1963). [iv] Hensley v. Municipal Court, 411 U.S. 345, 351 (1973). [v] Nowakowski v. New York, No.14-1964 (2nd Cir. 2016). [vi] Matter of Aguilar-Aquino, 24 I&N Dec 747 (BIA 2009). [vii] Matter of Aguilar-Aquino, 24 I&N Dec 747, 747 (BIA 2009). [ix] In July, 2015, ICE used approximately 9,300 ankle monitors—an increase of over forty percent since January 2015. Molly Hennessy-Fiske, Immigrants Object to Growing Use of Ankle Monitors After Detention, L.A. TIMES (Aug. 2, 2015), http://www.latimes.com/nation/ immigration/la-na-immigrant-ankle-monitors-20150802-story.html.